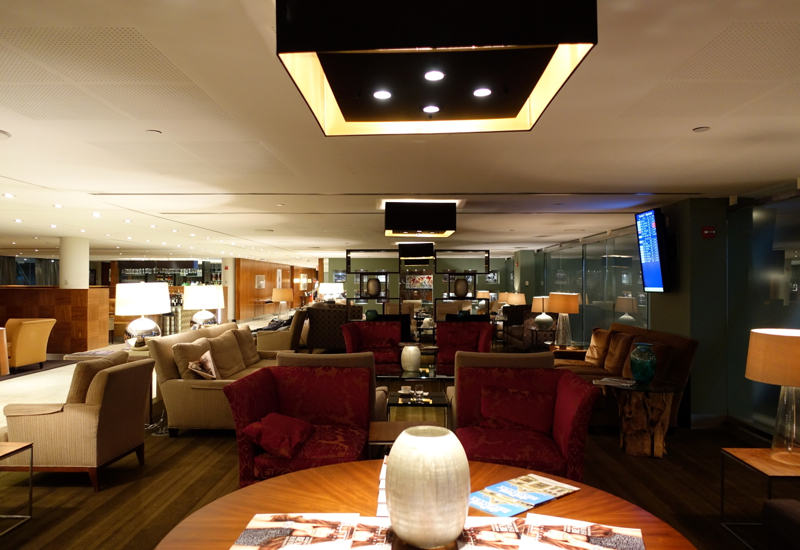 This British Airways Concorde Room Lounge JFK Terminal 7 Review is part of a trip report covering luxury travel in London, Dubai, Hong Kong and more. We left later than planned for our British Airways flight from JFK Terminal 7, but still managed to make good time courtesy of the LIRR and Airtrain. 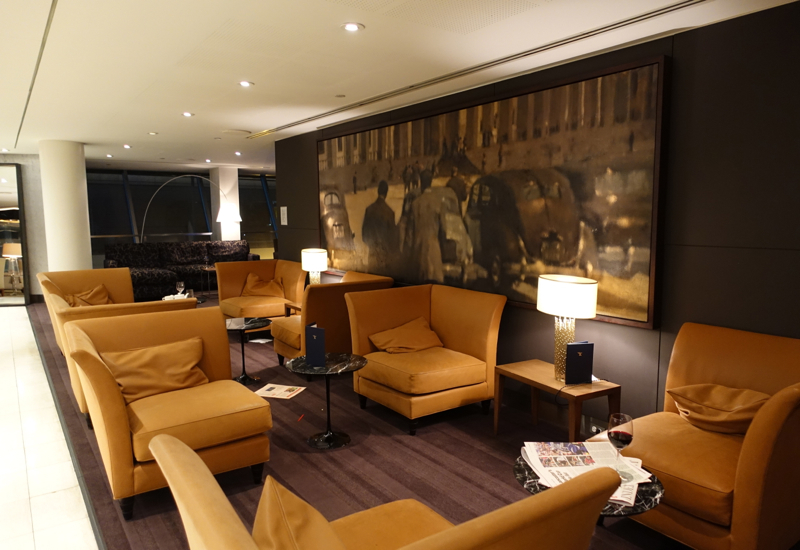 I'd only managed to book one British Airways first class award ticket and one business class award ticket, but the gentleman at the British Airways Concorde Room reception was friendly and kindly let both of us into the lounge. That was fortunate, since the munchkin was famished, as I hadn't had time to give him more than a snack before leaving, and it was past his usual dinnertime. We were immediately seated in the dining area, which has booths very similar to the British Airways First Class section of the Galleries Lounge at Newark Airport. Our server seemed to be delighted, rather than fazed, by having a 6 year old diner, which as a parent I really appreciated. She asked what we'd like to drink, and brought us menus. They looked good on paper, although I wondered whether they were overambitious for what the kitchen would actually turn out. I ordered the seared scallop over spiced chickpea cake, which was curiously served with a broth meant to be poured around it. While the broth ended up dissolving much of the chickpea cake, the taste of everything together was actually good, and better than I expected. 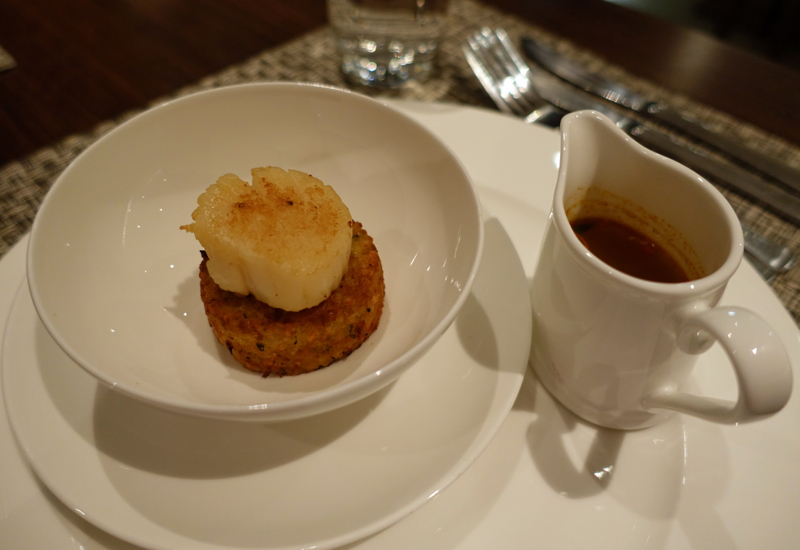 I gave the munchkin some of the seared scallop on its own, but the spiced chickpea cake and even the broth were too spicy to give him–not something you'd normally expect to get from British Airways, but a change I liked, since I enjoy spicy food. 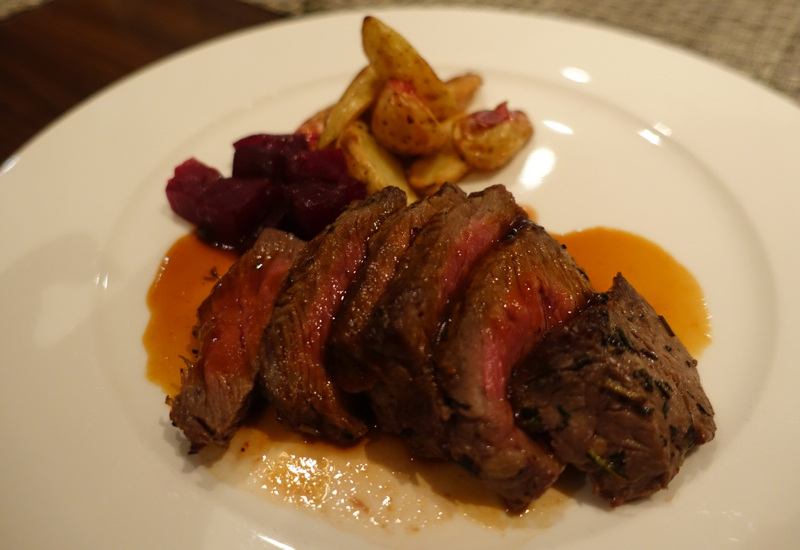 The munchkin had ordered the Grilled New York Tenderloin, and while this wasn't cooked the way I'd asked (I'd asked for it to be medium, and it came medium rare) I cut the medium bits for the munchkin, and he enjoyed it. Steak isn't my favorite food by any means, but the flavor was quite good, and I liked the beet accompaniment, which again is a bit unusual for steak. 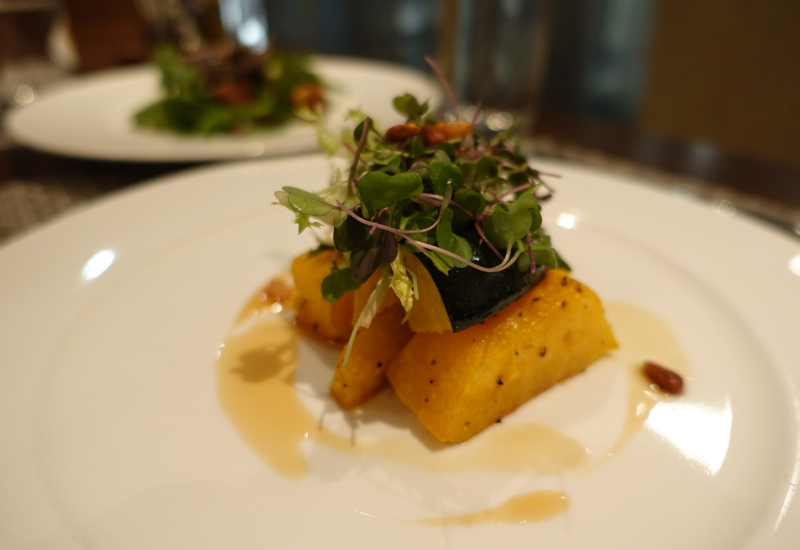 In addition to the scallop appetizer, I ordered the roasted squash and pumpkin, which was beautiful presentation-wise, prettily adorned with micro greens and pine nuts, and the squash and pumpkin were nicely roasted, even if I'd have liked them to be a little more caramelized. 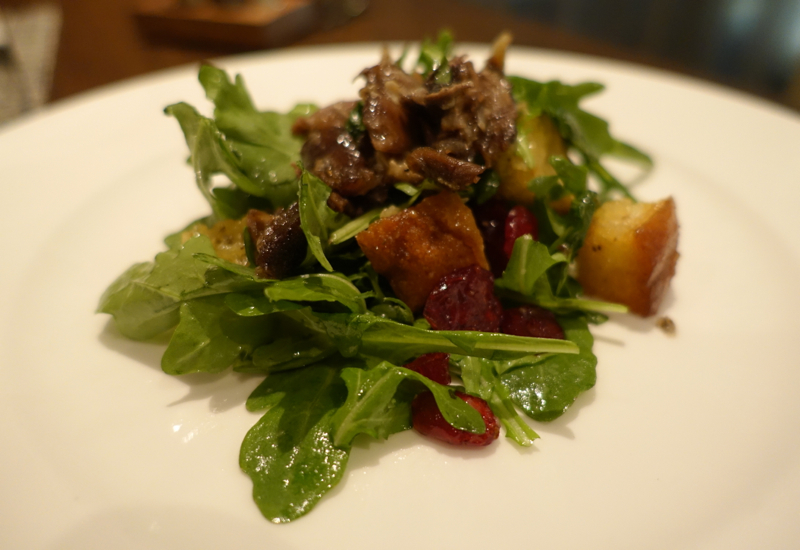 I also chose the baby arugala with duck confit, was was enough to be a light meal. As expected from the description, the bitter greens contrasted nicely with the richness of the duck and the sweet tart dried cranberries. 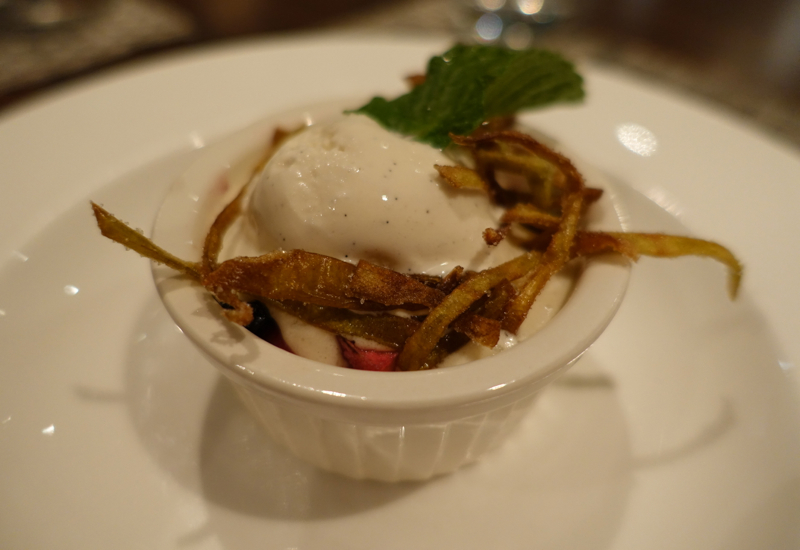 To conclude, we both enjoyed the Apple and Huckleberry Crisp with Vanilla Gelato. It could almost have been served (in a larger portion) at Grammercy Tavern, had the gelato not been quite so melted. The British Airways First Class Lounge has quite a bit of seating, so it wasn't nearly as crowded as, for example, I've seen the British Airways Galleries Business Class Lounge in the past. There wasn't a kids' room, but the munchkin was tired enough that after dinner he just wanted to lie down on one of the sofas in the back, darkened area by a large flat screen and the small business center area. I was very pleasantly surprised by how good the British Airways Concorde Room pre-dining options were. Better than our Newark experience (which was still quite good, if admittedly rushed) and also better than The Concorde Room at Heathrow. 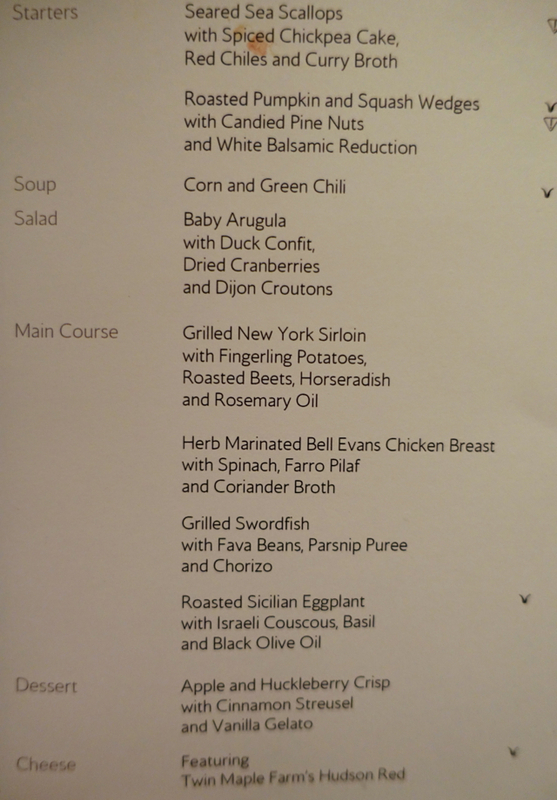 If you've been to the British Airways Concorde Room at JFK Terminal 7 and had the pre-flight supper, what was your experience?